*Update 1: McMike commented that this is the 1956 Porsche 356A Speedster that Petrolicious featured in a video in 2014 (see below). The owner’s name is Jon Warshawsky, a Director at Deloitte. 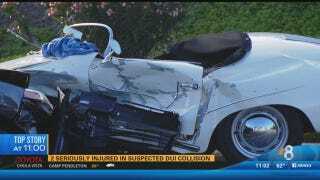 The two in the Speedster at the time of the accident were Jon and his girlfriend. The DUI suspect has 3 prior DUI convictions, the 2 passengers in the Porsche are still on Life support, and considered to be Brain Dead.